SCOTTSDALE, Ariz. — What started as a regular day at an Arizona grocery store has led to a life-long friendship. Blackbird, and her husband, met Alan Vandevander at a Whole Foods in Scottsdale, Arizona. They helped him get some food, started up a conversation, then parted ways. But the Blackbirds couldn't get the frail homeless man off their minds. They reconnected with him the next morning and helped him get to a hospital. Vandevander was severely malnourished. “He said, 'I’m glad they found me cause I was in trouble,' ” Blackbird said . After getting to know him, the Blackbirds did some digging and found out Vandevander has quite the story. He served in Vietnam and was awarded a Purple Heart, but he had also been missing for 40 years. His family in Indiana had no idea Vandevander was still alive. The two spoke on the phone just before Christmas for the first time in almost four decades. 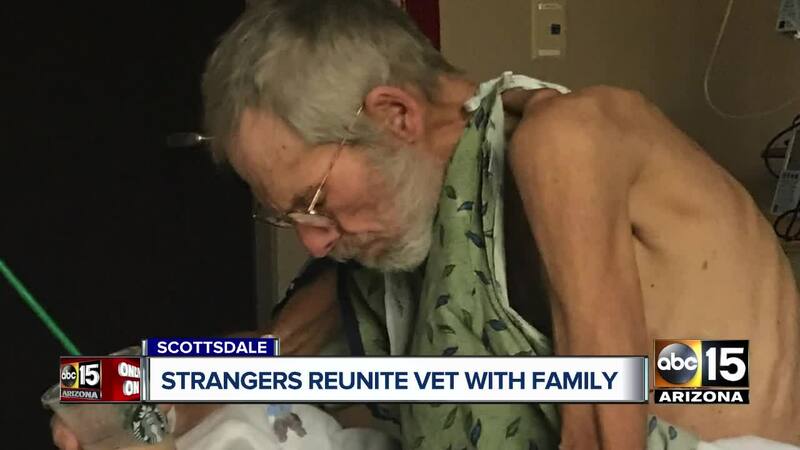 The Blackbirds have spent the last several weeks helping the man find the care he needs, taking him to hospitals and now the VA.
Vandevander's sister hopes to fly to Arizona later this month to reunite with her brother.